1) With a very light hand, brush from outer corner to inner corner with short, quick strokes. 2) Angle the brush while you apply -- at the outer corners, angle toward your cheekbones and move it progressively inward. 3) Brush through very lightly with an eyelash comb to remove any clumps. One coat is miraculously enough to give you full, lush, thick lashes. Mine actually hit my glasses! Now I'm a total convert. 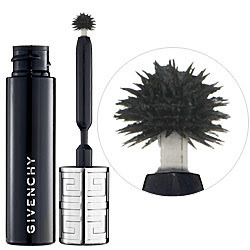 Givenchy Phenomen'Eyes Mascara retails for $32 at sephora.com. i love it from day one. check the lavender grey limited edition, the color is gorgeous! !